Modern housing areas, apartments and condominiums more often than not would hire security guards to keep an eye of the premises and surroundings. The first level of security is imposed at the entrance, where the guards have to keep an eye on vehicles and visitors to ensure there is no trespassing occurred. The guards also need to patrol the area to look out for any illicit activities or suspicious activities going on in the area and ensuring safe environment for all the tenants. 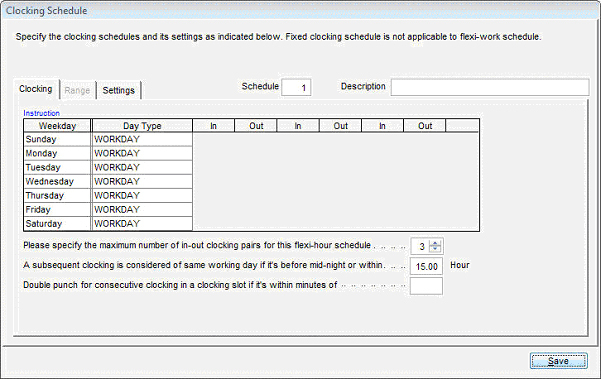 The security guards work according to predefined shifts. The team size of the security guards varies based on the duty of patrolling. The larger the patrolling area, the more security guards are required. Normally, there are 4 to 5 guards working per shift. They must carry out their daily routine i.e. patrolling, securing main entrance, responding to emergency cases, etc. The payroll of the security guards is under the neighbourhood committee or residents associations. Guards slacking while on duty such as sleeping, not covering the patrol area and swapping places with unauthorised personnel would not only waste the residents’ money, more seriously it could also jeopardize the safety of the residents. Without proper supervision, security guards might be a liability to the residents rather than an aid. To reduce security guards slacking occurrences to a minimum, FingerTec system could be introduced because with FingerTec, you have to be present in person to verify that you are on duty. Every security guard must verify his fingerprint at FingerTec® terminal at a specific time interval i.e. every 2 hours, as checkpoints. If there is no fingerprint verified at the hours required, the specific guards did not perform their duties. It is as simple as that. Supervision by a super is not required because FingerTec® terminals assume that role. Capturing attendance time and patrolling time of the every guard for certain time period. Preparing systematic reports and analysis for every guard for audit purpose. The system administrator has to enrol the guards’ fingerprints at the FingerTec® terminal. 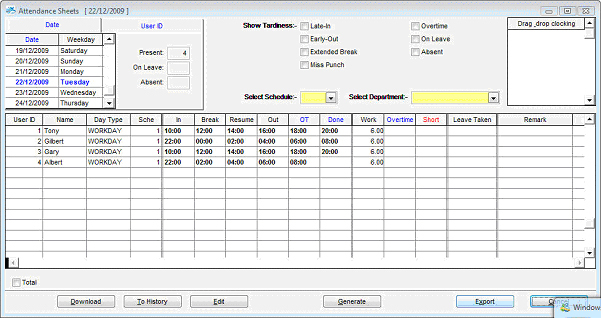 After the enrolment, the system administrator will download the user templates into TCMS V2 directly or it can be downloaded into a flash disk to be uploaded into the TCMS V2 software. 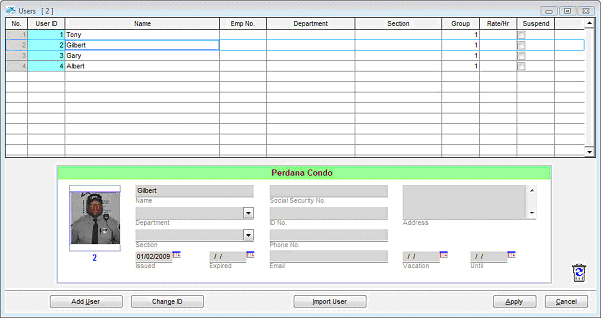 Insert all information of the security guards into the user details including their photos for records. In case the security guards are transferred to another building, the system administrator should upload the security guard templates to the terminals in another building by transferring the templates using USB flash disk. The guard will be assigned to flexi schedules. Each guard needs to punch at the checkpoint terminal every 2 hours during their working hours. The system administrator will download data from each terminal with the pen drive and download the data at the TCMSv2. At the end of the day, the system administrator will download the data from the terminal and the management could also check the guard transactions at the attendance sheet or the electronic time card reports. The guards will have six transactions per day if they punched every two hours during their working hours. Security guards who are slacking in their duties have to come out with explanation on their lack of discipline to the management. FingerTec system does not only heightened discipline level of security guards, it acts as a good control system for the guards. With minimum investment, housing areas get protection it requires with FingerTec.